If you are one of the (at the time of writing) 68 per cent of the Pies population who find Chelsea’s new day-glo away kit ever so slightly vomit-inducing, we might just have a solution (if you were in the market for a Chelsea away kit in the first place, that is!). 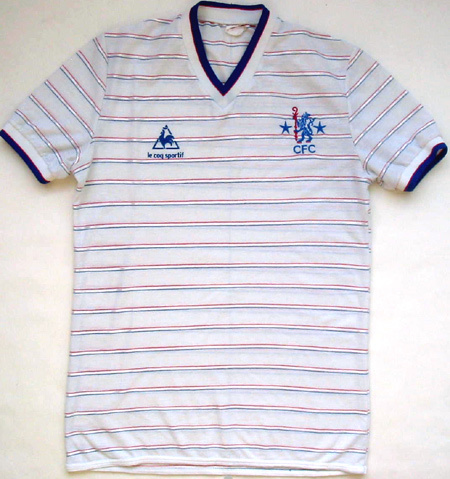 The brilliant ClassicFootballShirts.co.uk has a great range of retro football shirts, including this Chelsea away kit from the 1984-85 season, which is indoubtedly more stylish than the fluorescent monstrosity. The price for this little piece of Chelsea history is Â£129.99, but that’s no problem if you’ve got Abramovich’s millions burning a hole in your pocket. Click here to buy it.